Nitzanim – Rav Shai Finklestein after mincha which is at 4.35. 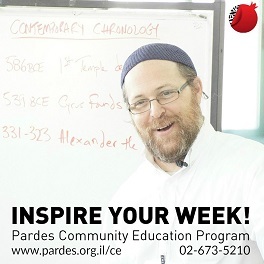 Eretz Chemdah – Parsha shiur at 8am and drasha. 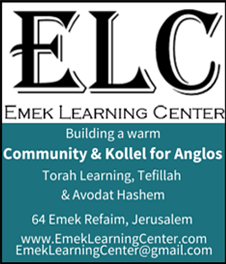 ELC – Rav Berzon at 8 and then 4.45 seudah shlishit and shiur. Shir Chadash on Ohel Nechama premises at 8.45am, at Emek Refaim site at 9.15am. Daf HaYomi – Hour before shabbat out at the Katamon Shteiblech . 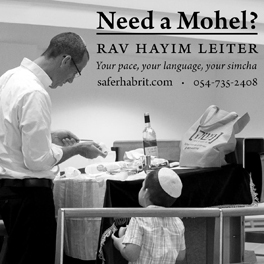 “Speak to Bnei Yisrael and take for me a donation [towards the building of the Mishkan]” (Shemot 25:2). Rashi notes that the extra word used in this pasuk “Li – for me” teaches us that the donations must be made “lishma” – specifically intended for the purpose of the Mishkan itself, without any ulterior motive. This notion of “lishma” is not limited to donations to the Mishkan. 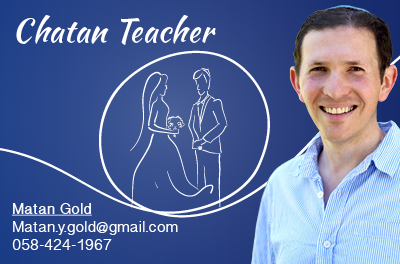 Tzitzit, Tefillin and Sifrei Torah, for example, must also be prepared “lishma”. The Gemara (Pesachim 50b), however, says that “One should always involve himself in Torah and mitzvot, even not for their own sake (shelo lishma), for through performing them that way one will ultimately come to perform them for their own sake (lishma).” If, as the Gemara says, it is okay – albeit not ideal – to perform mitzvot “lo lishma”, why was it imperative that the donations to the Mishkan were offered “lishma”? Rav Shimon Schwab suggests that the aforementioned Gemara is referring to actions. Good actions are intrinsically valuable, even without the preferred “lishma” element. When it comes to endowing items and objects (such as the Mishkan, Tzitzit, Tefillin, Sifrei Torah etc.) with sanctity, however, then the initial intention is critical. The purpose of the Mishkan was to provide Hashem with a place for us to experience His sanctity in this world. However if we were to merely build the structure devoid of manifest lishma then the building would be nothing more than a lifeless shell. By embedding the foundations – through the donations – with the requisite positive intention we ensured that the Mishkan was transformed into a holy edifice capable of housing the greatest sanctity in the world. We learn from here that even though good actions are always positive even without the right intention, nevertheless in order to create the foundations for holiness, intention is pivotal!